Ah the sights of Paris. Le Eiffel tower. Le Arc De Triomphe. 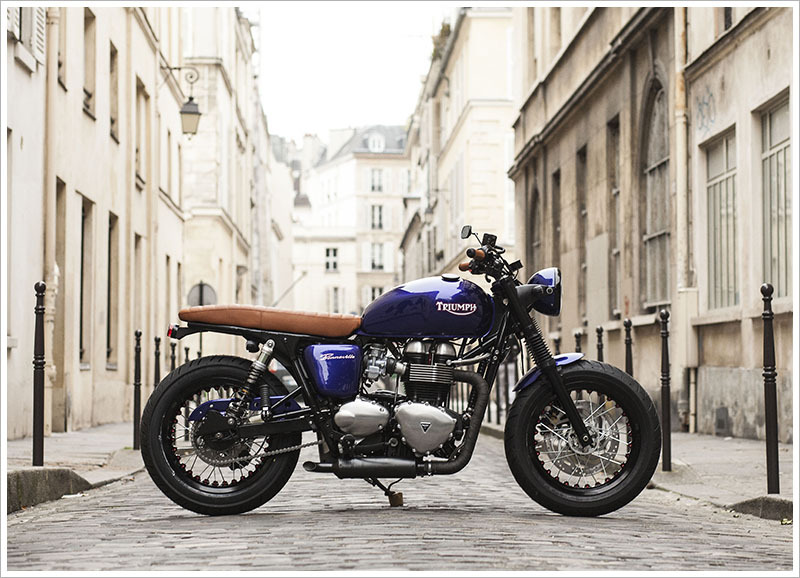 Le modified Triumph Bonneville. The last of these is a recent addition to the visual splendour of Paris, and we have Vintage Racer Motorcycles to thank for the pleasure. This Bonnie was created for a customer who turned out to be a prince from Qatar, or an ’emir’ in french – so they named the bike ‘Bobbemir’. It has been built with all the hallmarks of Vintage Racer’s belief that their bikes should be ridden not hidden. Whether as an every day rider or something to take for a burn on a Sunday afternoon, their bikes are for blowing out cobwebs, not collecting them. This bike is as much a monument to French engineering as the Eiffel tower, but le tower Eiffel never had a chance to sport pipewrap.